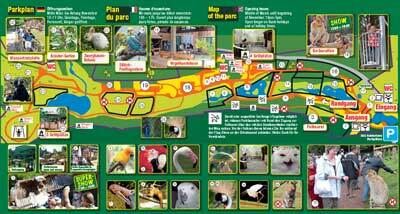 Vogelpark vouchers of your choice! Surprise your family, colleagues and business friends. If you enter your name under "wünscht" (=requests) in the empty box, a personal note will accompany your gift. The vouchers will be sent to you by post free of charge after payment. Vouchers can also be obtained at the park entrance. 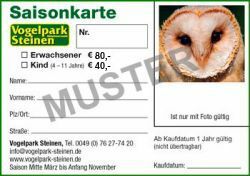 Voucher for a single, free visit for adults in the Vogelpark Steinen. 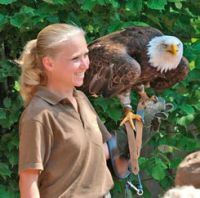 Voucher for a single, free visit for children (4-11 years) in the Vogelpark Steinen. The Special Falconry Programme takes place from May on Wednesdays, Thursdays and Fridays (except for public holidays) from 4.30pm after the feeding of the macaques. Maximum number of participants: 4 persons. After the date you wish to come has been verified, you will receive a confirmation. Your participation in the Special Falconry Programme is definitely booked only when payment has been received. This is because of the high demand and limited number of participants. Our tip: Pay as soon as the date of your visit has been confirmed in order to ensure your participation. In the event of unfavourable weather such as heavy rain, thunderstorm, snow, extreme heat an alternative programme will be proposed. The season ticket is valid for 1 year from the day of purchase. Please bring a passport photograph with you which can be affixed to the ticket after purchase. You are then entitled to a visit to the park.